Better than reality | What the iPad means for augmented reality. Great screen? check. Gps? check. Compass? check. mobile internet? check. Camera? fail. A game-changing lap sized computer without a camera? A back & front camera would have been great for AR applications. But wait. what about this? 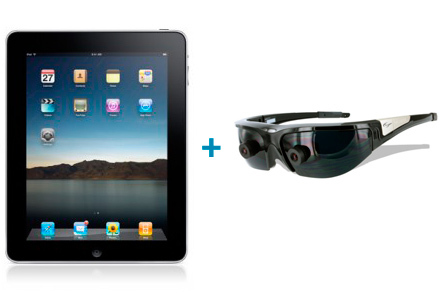 Ladies and Gentleman, at your left the new iPad, at your right Vuzix Wrap 920AR 67-inches video eyewear with integrated video cameras. Coming soon together?! I hope so. A quite expensive board game platform, but at least i’m sure that playing Risiko without losing tanks around can be an improvement..